The chic Halkin has elegant bedrooms, a private gym and Michelin-starred Thai cuisine. It is set on a peaceful street, 10 minutes’ walk from the shops of Knightsbridge. 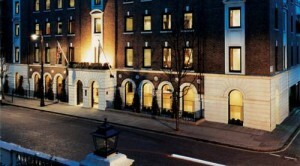 It is a glamorous London hotel about 800 metres from Hyde Park. Its stylish rooms have a marble bathroom, free Wi-Fi and 24-hour room service. Excellent Thai cuisine is served at nahm, and The Halkin Bar offers cocktails, afternoon tea and all-day dining. The Halkin offers access to COMO Shambhala Urban Escape, an Asian-inspired spa 5 minutes’ walk away. Hyde Park Corner Tube Station is a 3-minute walk away.